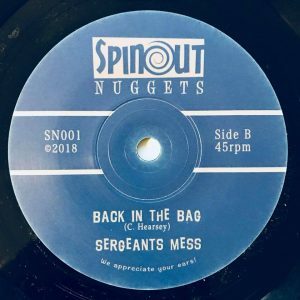 Medway group Sergeants Mess are back, finally unearthing their second release! Johnny Barker – Guitar, Bass (BITB), Vocals. Chris Hearsey – Bass, Guitar (BITB), Vocals. Wolf Howard – Drums, Percussion. 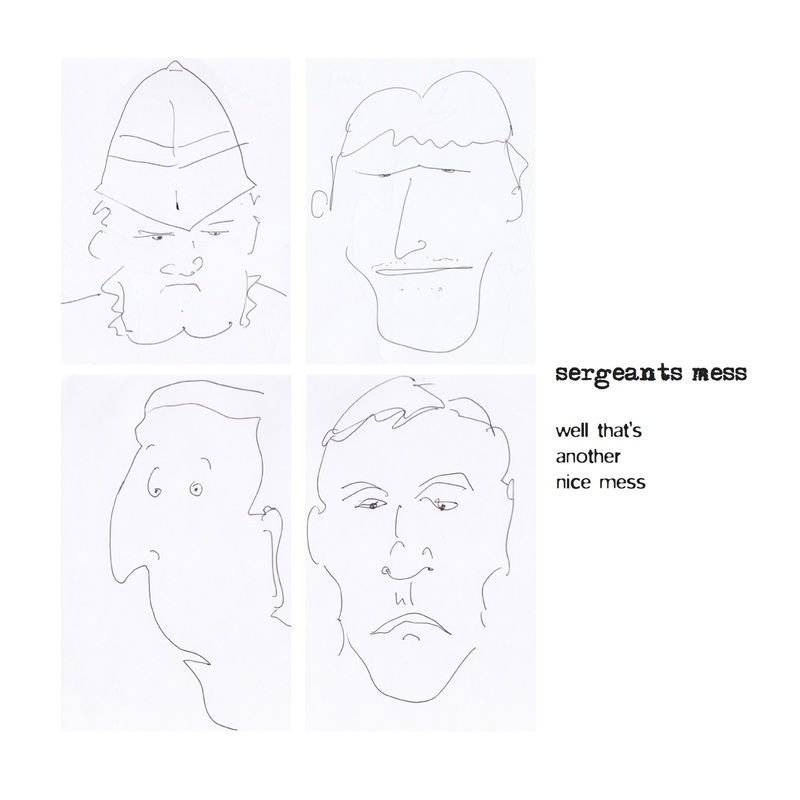 Formed in Medway, shortly after the turn of the millennium, Sergeants Mess are a collective of masters from the Delta, forming to give the people what the people need. 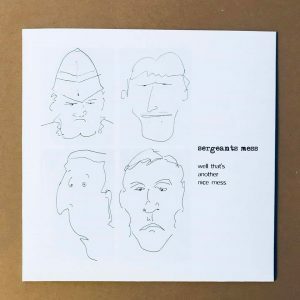 Originally recorded back in 2013 at Sandgate Studios (with Mole at controls), the Medway based quartet haven’t released anything under this guise since Billy Childish produced their first 4-track EP release back in 2002. 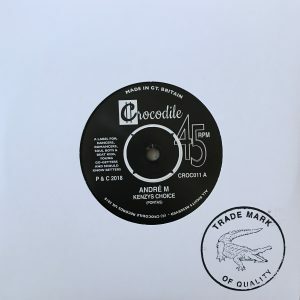 They certainly haven’t been quiet though – as per any Medway musician, each have been record- ing in many other outfits, either singularly or together, reaching ears from all four corners. The two sides of this release are certainly like a Heads or Tails of a coin, but there are no losers here. 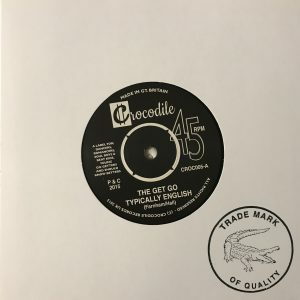 With writing credits to both Johnny Barker (Couldn’t I Be Yours) and Chris Hearsey (Back in the Bag), Chris could possibly be the best songwriter in Medway, but no-one knows it………yet! Formerly of Somersault and The Vandebilts, Chris also has many unreleased tracks of his own up on his Soundcloud page. Johnny Barker needs no introduction, but for those that don’t know, here’s where you will have heard him before – The Daggermen, Dodson’s Dogs, The Buff Medways, Goodchilde, Graham Day & the Gaolers, The Kravin A’s, Micky & the Salty Sea Dogs, Johnny Barker’s Bandits and currently The Senior Service. And certainly not forgetting the handsome members of the Mess, Darryl and Wolf, you would have seen or heard Darryl Hartley in The Vandebilts, Alvin Purple, Groovy Uncle, Phaze and more re- cently The Senior Service. Wolf Howard gets about too, and has hit the skins for the following The Daggermen, The Buff Medways, The Prime Movers, James Taylor Quartet, Goodchilde, Graham Day and the Forefa- thers, Dodson’s Dogs, Micky & the Salty Sea Dogs, The Chatham Singers, The Dear Watsons, The Guy Hamper Trio, The James Taylor Quartet, The Kravin’ “A”s, The Solarflares, The Spartan Dreggs, The Stuckists, The Vermin Poets and Wild Billy Childish & The Musicians Of The British Empire and most recently CTMF and The Senior Service. 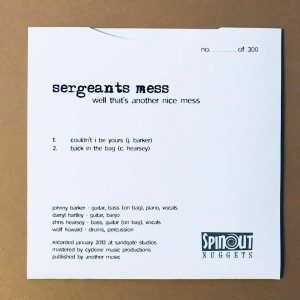 On this limited 7” vinyl release of 300, the Mess provide two stormers, each in it’s own parallel uni- verse, giving two options of their mulit-tool. 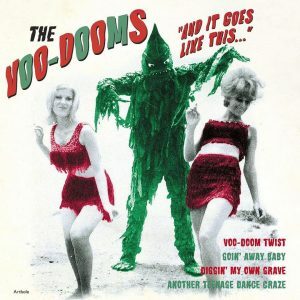 Couldn’t I Be Yours gives a respectful nod to the Garage output of the 60s, and Back In The Bag is an experi-mental, yet very well constructed and funked up Gorrilaz-esque wonder. 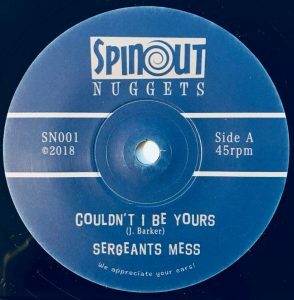 Released on the newly formed Spinout Nuggets label, if enough copies are shifted, we might be able to persuade the Mess for a live outing! But until then, you can catch them in The Senior Service and CTMF, amongst others.